I enjoyed a nice staycation at the Claremont with my sisters and nieces who trekked from SoCal. The 4th Annual Berkeley Wine Festival opening reception on March 16, 2013 featured over 100 wines, 45 wineries and 1300 attendees. The Ward Women enjoyed an afternoon being pampered in the spa prior to the evening reception. I highly recommend reserving a room if you attend next year’s festival. Born out of our frustration with the glaring exclusion of films and discourse by, about or for Black women in Julia’s film school experience and our deep love for the possibility of Black feminism in all forms, Black Feminist Film School is a collaboration between Black feminist scholar/filmmaker Alexis Pauline Gumbs, Ph.D and Black feminist filmmaker/scholar Julia Roxanne Wallace, M.Div. 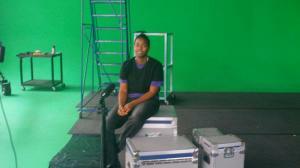 Julia in the green screen studio. building community between existing Black feminist filmmakers, with an emphasis on queer and genderqueer Black filmmakers creating an all queer of color and allied cast and crew for Julia’s upcoming film!